It was back in July 2017, that even before a well had been drilled, INEOS has applied for – and had been granted – a sweeping injunction against “Persons Unknown”. The order outlined how anyone who was deemed to undertake “harassment”, “intimidation” or even “annoyance” against the shale industry, was at risk of being the subject of legal action. The injunction warned anti-fracking protesters that if they disobeyed “this order you will be held to be in contempt of court and may be imprisoned, fined or have your assets seized”. At the time there was outrage about the wide-ranging nature of the injunction, which had serious and chilling ramifications for the right to protest in the UK. 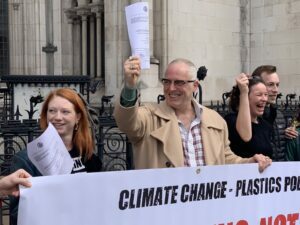 In September 2017, the injunction was challenged by Joe Corré, the businessman and son of fashion legend, Vivienne Westwood, who also runs the group, TalkFracking. It was a David versus Goliath case, as INEOS is run by Sir Jim Ratcliffe, Britain’s richest man, according to the latest Sunday Times Rich List. And yesterday, Corré, assisted by Friends of the Earth, was victorious in his legal fight against INOES and Ratcliffe. At the Court of Appeal, three judges ruled that it was unlawful to bring an injunction against certain classes of “Persons Unknown”. The ruling said the High Court order was “both too wide and insufficiently clear”. The judges also agreed that the concept of “slow walking” on a public highway, which is used by anti-fracking campaigners, was a legitimate form of protest. The victory in the Court of Appeal will also have knock-on implications for other fracking companies, who copied INEOS’s excessive legal tactics with their own prohibitive injunctions against campaigners, which threatened the UK’s long-established right to peaceful protest.